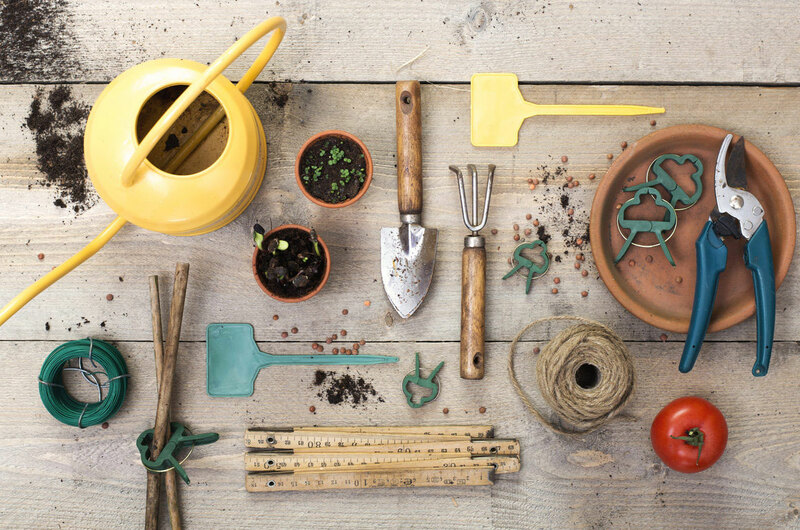 With Spring finally making an appearance, your green fingers might be itching to get in the garden! But what sort of gardening tasks should you actually be doing to create the perfect Spring garden? 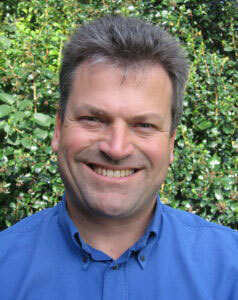 Read this guest blog from Matt Biggs for the ultimate guide to Spring gardening. You may want to start sowing seeds as soon as the sun appears but Spring showers can leave gardens waterlogged. So despite what it says on the seed packet, don’t start sowing seeds directly into the soil in Spring if it is too cold and wet for good germination. Wait until the soil is warm and dry enough to rake a seedbed, then germination will be quicker and you can make up some lost time. This applies to most seeds, which take longer to germinate in lower temperatures. For example, peas and parsnips take four weeks or more to appear when sown in early spring but only ten days if temperatures are higher. Turnips, radishes, broad beans and peas germinate at soil temperatures above 41F (5C), whereas leeks, onions and potatoes need a minimum 45F (7C). 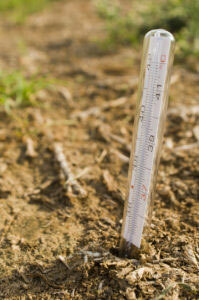 A soil thermometer is a worthwhile Spring gardening investment so you can check the exact temperature before you sow. Beetroot, broad bean, carrot, kohl rabi, leeks, lettuce, pea, radish, salad leaves, spinach, Swiss chard and turnip can be your earliest sowings in your garden in Spring. Choose ‘bolting’ resistant varieties for early sowings to reduce the risk of them running to seed prematurely, then cover the ground with cloches or horticultural fleece to protect emerging seedlings from pests and diseases and chilling winds. Make extra sowings in modules or plugs in a greenhouse, or on a sunny windowsill as a back-up – while the ground is cold you can beat the weather by sowing all of the above indoors in trays or modules. Sow beetroot, radish and turnip in 7.5cm pots and grow them in clumps rather than continuous rows. Another way to warm up the soil before sowing in Spring is to cover the ground with clear or black polythene, which also protects it from excess wet. Clear polythene is best, as it encourages weed seeds to germinate – these can then be hoed off before sowing seeds, so they don’t compete with your germinating crops. You should always try to keep on top of weeds all year round, but keep an extra keen eye out in Spring for ‘Hairy Bittercress’ and ‘Chickweed’ which germinate at lower temperatures. Remove them before they flower and set seeds to reduce populations. Weed-free flower borders can be mulched with a 5-10cm layer of partially rotted bark, in late spring when the soil is moist and warm, leaving a small gap between the tree or shrub trunks and the mulch. Slugs and snails are one of the most common garden pests in Spring – control them by keeping the garden free of plant debris as much as possible. You can also trap them in ‘slug pubs’ made from jam jars or margarine tubs buried with the rim 15mm above the soil, so slug predators like ground beetles are not accidentally drowned, then fill the container with stout or ale. Check them regularly and empty as required. Try slug hunting in the evening; lie sacking, roof tiles, upturned grapefruit or lettuce leaves on the ground then collect them from their hiding places. Encourage natural predators like hedgehogs (set up log piles for them to make a home in), frogs and toads (make a small pond or stack flower pots in damp spots), and song thrushes (leave ‘anvil stones’ for them to break open snail shells on). For any really cherished plants, you can be more defensive and use copper tape round the rim of pots or raised beds, or make ‘collars’ cut from plastic drinks bottles and put them around seedlings. Finally when considering pest control for your garden in the Spring, try grit, wool pellets, garlic spray, crushed oyster shell or Aluminium sulphate or Ferric phosphate pellets. 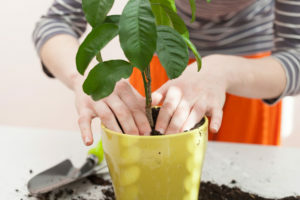 Repot houseplants in Spring at the start of the growing season. Check if they are ‘pot bound’ (where the roots of the plant have circled round each other and broken down the soil in the pot) by easing them gently from the pot. If it is stuck fast, you can slide an old kitchen knife between the pot and the root-ball to ease it out. Pot bound plants should be transplanted into a pot one or two sizes larger. Terracotta pots should be soaked overnight and given a good scrub; plastic pots should be washed with a little detergent and bleach and rinsed thoroughly. First put a layer of broken terracotta, polystyrene pieces or bottle corks in the base of the pot to help drainage, then tease out some of the roots from the root-ball before planting in the larger pot. Re-fill around the root-ball with compost, firming it up in layers with your fingers or the end of a bamboo cane, as you go. Don’t plant too deeply and leave a gap between the rim of the pot and the top of the compost for watering. Finally, top-dress the surface with gravel or fine bark mulch to conserve moisture and discourage fungus gnats, which like organic compost. Water thoroughly, allow plants to recover in the shade for a few days then put them back on display. If your plants aren’t pot-bound and don’t need new pots, just carefully remove the top 2.5cm of compost with an old dining fork, then replace it with new compost mixed with slow release fertiliser. Remove dust from hairy leaves with a make-up brush and wipe glossy leaves gently with a soft damp cloth. It is easier to put larger plants outside for a wash in the spring rains when the weather warms or wash them in the shower with a gentle jet of tepid water then your plants will be in tip top condition for Spring. Do you have any other tips for Spring gardening? What jobs do you always do in Spring in your garden? Share them with us in the comments below. Matthew Biggs trained at the Royal Botanic Gardens Kew and has over 25 years’ experience as a professional gardener.He is a regular panellist on BBC Radio 4’s Gardeners’ Question Time and the author of many books on gardening. To find out more about Matthew, click here. This is such a handy guide and suitable for gardeners of all levels of experience. Spring is definitely the optimum time to weed your garden and revive any abandoned house plants. The detail you went in to with regard to sowing seeds was really interesting too, because of course not all seeds are the same! Thanks for sharing this guide.